related portals: National anthems, Japan. 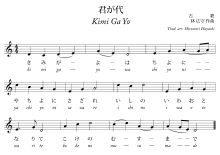 Kimi ga Yo (君が代, "May your reign last forever") is Japan's national anthem, and is also one of the world's shortest national anthems in current use. The lyrics are based on a waka poem written in the Heian period (794-1185), sung to a melody written in the later Meiji era (1868–1945). The current melody was chosen in 1880, replacing an unpopular melody composed eleven years earlier.— Excerpted from Kimigayo on Wikipedia, the free encyclopedia.